How can you talk about something you can’t remember? Before the ski trip, sixteen-year-old Cassidy “Sid” Murphy was a cheerleader (at the bottom of the pyramid, but still...), a straight-A student, and a member of a solid trio of best friends. When she ends up on a ski lift next to handsome local college boy, Dax Windsor, she’s thrilled; but Dax takes everything from Sid—including a lock of her perfect red curls—and she can’t remember any of it. Back home and unable to relate to her old friends, Sid drops her college prep classes and takes up residence in the A/V room with only Corey “The Living Stoner” Livingston for company. But as she gets to know Corey (slacker, baker, total dreamboat), Sid finds someone who truly makes her happy. Now, if she can just shake the nightmares and those few extra pounds, everything will be perfect... or so she thinks. Witty and poignant, Colleen Clayton’s stunning debut is a story about moving on after the unthinkable happens. Sixteen year old Sid Murphy learns that tragedy can strike anywhere and to anyone. On a ski trip with her high school, Sid decides to step outside of her circle of amazing friends, cheerleading and good grades for a night on the wild side. The last day of the trip she finds herself waking up in a strange room with no idea what happened the night before. Colleen Clayton highlights the consequences of Sid's decisions and focuses on the aftermath that brings Sid a greater sense of self. What Happens Next is poignant and deeply touching. The growth the readers will see as Sid explores who she is after the ski trip is a precious blossoming, one that deserves reader sympathy. Clayton reaches far into the dark recesses of the teen mind to bring us a realistic story of survival and acceptance. It's amazing how many frequent teen worries Clayton writes about while keeping the focus solidly on Sid's downward spiral. Sid's relationship with her two best friends, Paige and Kirsten, falls apart and leaves Sid feeling confused and lonely. As other aspects of her life continue to unravel, Sid starts running every night and watching her weight like a hawk. The aspects of her image that she's always struggled to embrace, curly red hair and curvy hourglass figure, become hideous reminders of that night she can't remember. Switching from web page development class to AV brings Sid some amount of stress relief. It's there that she meets Corey Livingston, "the Living Stoner", and thus Sid realizes that she can move on from the nightmare that has befallen her. Corey becomes an essential part of the plot, with his own secrets and strong connection to Sid. He's the light that keeps Sid from drowning in her own dark desire to purge food and over-exercise. Their romance is undeniably sweet and lightens up the novel's serious tone, also keeping it from crossing the line to depressing or hopeless. 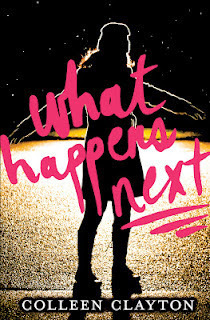 What Happens Next is a debut novel to read and will forge an unshakable faith in Colleen Clayton's ability to relate to the teen audience and beyond! Have been wanting to read this for agesss.. I must find out what happens to Sid!